What makes a great radio jingle? Classic FM have got it figured out, thanks to composer David Arnold, who wrote the original tune, which has been recorded more than 200 times by top classical artists. In this interview Tim Lihoreau reminisced with composer David Arnold about his compositions and links with commercial radio, which resulted in Classic FM’s trademark jingle tune. It’s success is all thanks to the melody. This memorable tune has been recorded by top classical artists like the Swingle Singers, Royal Philharmonic Orchestra, Bryn Terfel and Lesley Garrett, among others. “It’s stayed there for 20 years, so it must be quite a good tune!” says David. 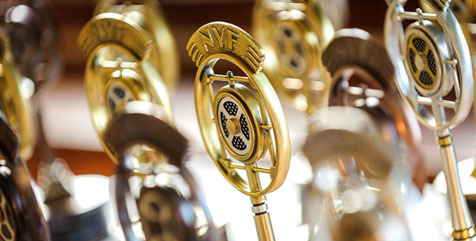 To read The Radio Magazine‘s interview with David Arnold, click here. 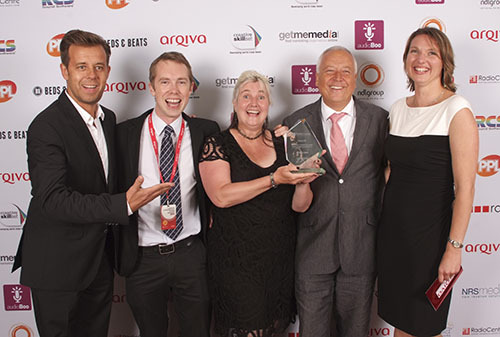 Following on from their Sony Awards success earlier in the year, David Arnold Music win another award for Classic FM – this time it’s the prestigious Arqiva Radio Academy Award for Best Station Imaging. 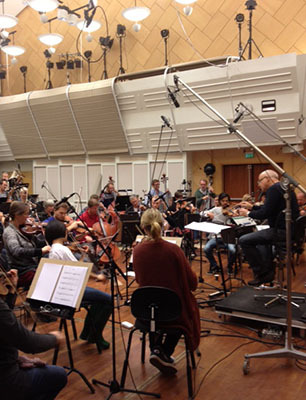 David Arnold Music has been supplying iconic radio imaging to Classic FM for over 20 years, and the instantly recognisable theme has been recorded over 200 times, in various forms. Picture: David (second from top right) during the celebrations at the Sony Radio Academy Awards this year as Classic FM accepted the prestigious “Brand of the Year” award 2013.